Donna Eden is most definitely a pioneer in the field of Energy Psychology and she was born with a gift. That gift is the ability to see 9 different bodily energy systems. However, Donna never used these gifts until her late 20s. At the age of 27, She was suffering from Multiple Sclerosis and could not move her muscles. She was told by 5 medical experts that she was going to die. This was when she started to take matters into her own hands, and began experimenting with her body’s energies. She discovered that she can manipulate these energy systems, and slowly started to heal herself. For the past 40 years, Donna has been relentlessly proclaiming, teaching, and demonstrating that our body is nothing but a collection of energy systems and that there are scientific means to naturally reclaim our health and vitality. 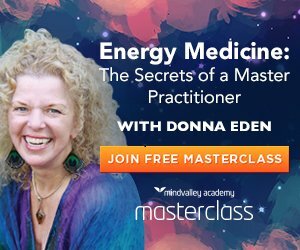 She has dedicated much of her life to developing the Eden Energy Medicine techniques and is the leading proponent of Energy Medicine in America, and together with her husband David Feinstein, PhD, (a pioneer in Energy Psychology), they run the worlds largest Energy Medicine school. They have trained more than 100,000 students including physicians, nurses, and other mainstream health professionals. Donna Eden's energy medicine techniques help you learn the language that your body already speaks in and understands and shows you how to actually apply it. Now, if you've signed up to receive my free "7 Tools for Energetic Self-Care" Mini-guide and short-cut guide...you'll see that this is Tool #1 that I recommend. I believe so much that transformation and change all comes down to working with our body's energies and frequencies. Our emotional energies, our physical energies, as well as the subtle energies that we can't see but know are affecting every part of our life experience. I want you to experience the shifts that are truly possible when using these simple techniques so you can, right from the start, get a taste of the transformation that's right at your fingertips. So to begin incorporating this into your daily life, what I recommend you do is practice Donna's daily routine each morning. You can follow along and do the exercises in the video above learning movements like the "Cross Crawl", "Wayne Cook posture", "Connecting Heaven and Earth", and the "The Three Thumps" and once you get used to them (and you will) you can do them anywhere, anytime. I tend to like to do them when I wake, and it's also easy to remember to do in the shower each day. This energy medicine routine will help increase your energy and vitality, clear your mind so you can think better, and help your body recover from illness. You can visit Innersource.com to look over more of Donna's work. I want to HIGHLY recommend one fantastic way for you to explore the world of Energy Medicine for health and healing by watching this eye opening demonstration where you’ll witness firsthand how energy actually runs our reality and walk away with at least 4 different energy medicine techniques. Tool 2: Conquer stressful situations with two fun energetic shortcuts. Anyone can do this. You don’t have to be a healer. It also turns you into a person others secretly admire. Tool 3: Choose the right food with just… Energy. Learn this unusual energetic testing exercise that’ll show you what to eat with shocking precision. You many be noticing that more and more people are now feeling crippled by the limitations of Modern Western Medicine’s “crisis care” style of medicine and this Complementary Alternative Medicine (CAM) has become a savior to many. Sign up for the Energy Healing Masterclass and learn for yourself!